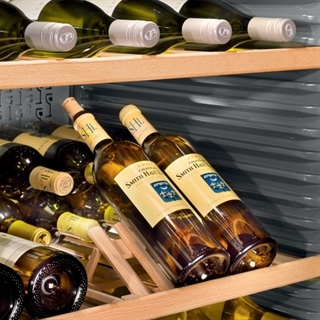 Liebherr Wine Cabinet - Additional Wooden pull-out shelf for GrandCru models WKt5552 & WKes4552. Buy an additional shelf for your Liebherr WKt5552 or WKes4552. These handcrafted wooden shelves provide extra storage for your favourite bottles of wine (Bordeaux bottles). The shelf is made from natural untreated wood and is a welcome addition to your Liebherr wine cabinet. The practical presentation shelf fulfils bottle storage as well as presentation; which will certainly impress.